Come and spread your creative wings with the Create and Make Workshop Series! Wish you could pull up and give way to creative abandon from time to time? Look no further: The Create and Make Workshops are here and are guaranteed to be tons of adult-creative fun! We hope you can attend the new date! 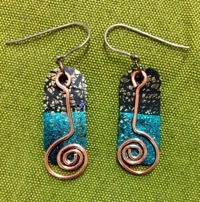 Discover creating dichroic glass-like effects and textures, combined with copper wire to create pins or earrings! The instructor will provide a variety of texture tools for you to design your unique pieces of beautiful jewelry for you, or as a gift for someone special. The workshop will take place on Wednesday, March 27, and is held from 6:30 – 8:30pm in the Shoreline/LFP Senior Center, 18560 1st Ave NE, Shoreline, WA.